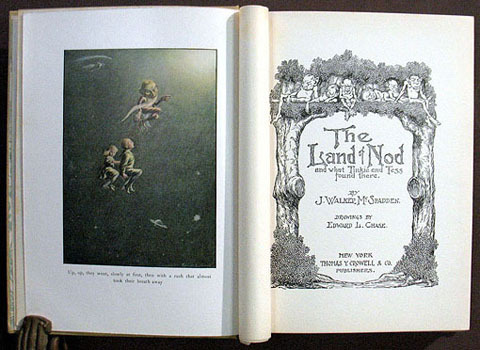 The Land of Nod and what Tinkle and Tess found there. New York: Thomas Y. Crowell & Co. Publishers, (1909). ￥57,000 (税込み) 23.4 x 17.5 cm. viii, 137 pp., with color frontis. and many illustrations. Original illustrated cloth, colorful printed paper label affixed to front cover, pictorial endpapers, some internal soiling.